A solid marketing strategy is essential for any company. But even more important than that is keeping or recovering past customers. That’s because relationship marketing is much cheaper and more effective than just advertising. So today we’ll look at different strategies you can use to win back lost customers. We’ll also see how you can implement these strategies by using your past WooCommerce customer data. Before talking about recovering customers, let’s talk a little bit about what relationship marketing is. Relationship marketing is usually defined as the efforts to retain customers or keep your relationship alive. Therefore, while advertising and regular marketing focus on reaching new customers, customer relationship marketing focuses on keeping the ones you’ve got. This may seem obvious, but it’s hard to do if you don’t set up a strategy for that. There are many components of a good relationship marketing strategy. There are strategies related to how you welcome new customers. In addition, there are strategies about how you encourage repeat purchases. Customer relationship marketing is usually defined as the efforts to retain customers or keep your relationship alive. One of the greatest advantages of relationship marketing is its cost of acquisition. Studies show that relationship marketing efforts cost one-fifth of regular marketing. Also, it’s much easier to sell to someone who already knows you. Furthermore, a key component of a good relationship marketing strategy is recovering lost customers. When applying a customer recovery strategy, you still have the benefits of the customer relationship marketing principles. That’s because they already know you, and you know them as well. It’s very likely that you have relevant data about them. Something you just don’t have when dealing with new customers. Additionally returning customers buy more and buy more frequently. They’re often less costly to serve because of their familiarity with your company and how your product works. Hence, today we’ll see how you can use all of these principles in a WooCommerce site. How to make use of your current data to win back customers. How to use past orders to find lost customers. We’ll also see how you can track down the main exit points, and fix any issues that you may have. Before recovering our lost customers, we need to find who they are. There are many metrics that we can use to check if a customer is no longer an active customer. Let’s see a few of them. If you sell products that wear out, or that need to be bought within cycles, we can track down activity levels this way. So, for a product that should expect monthly purchases, if a customer hasn’t bought in more than 2 months, it’s likely that this is a lost customer and that they won’t buy again. 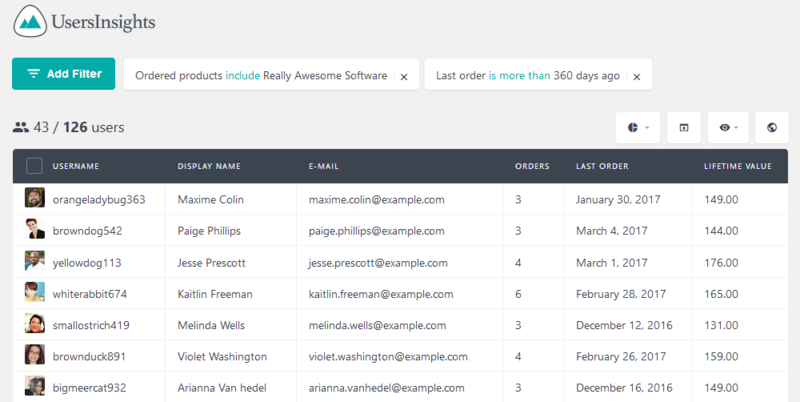 This can be done by checking users who have bought a product and compare their last order. Even though the “last order filter” gathers all orders, this filter works fine. That’s because even for those who buy a lot of products at once if they fall into this filter, they aren’t buying as often as you’d expect. There are also products that are complementary. If a user buys a digital camera, you’d expect them to buy camera lenses as well. There are many cases where your products are evolutions, and you can track down users who haven’t bought both. For that we’ll use a similar filter, checking for two product purchases, one as “include” and one as “exclude”. Also, you may want to exclude recent orders. In this way you’ll avoid false positives for your lost customers. If you have software products or licensed products the renewal rate is a good metric. Also, in this case, in particular, you may want to send reminders before the license is expired. You just need to replace that time with your expected renewal time. It could be the entire license duration or a bit less, so you can give your customers some extra time to buy. There’s also the edge case of winning back users who haven’t been customers yet. Sometimes we have freebies or user registration, but they may not turn into customers. This case is interesting because these users already know you and your brand. So it falls into the relationship marketing scope, even though we are still gathering new customers. Furthermore, we could find a full list of lost customers on our site. For that, we can define a metric of maximum inactivity and then filter these users. For example, you may consider that anyone who hasn’t logged in into your site for 3 months or more is no longer a customer. Each business needs to tailor this time to better suit their needs, but you’ve got the idea. Now that we know who our lost customers are, let’s find out why they are no longer customers. Once we know the main exit points, we can do a thoughtful analysis. It’s time to dig deeper and try to find out where our main issues are. It could be something as simple as a procedure that needs to be adjusted. Or it could be something more drastic, as an entire product line is defective. Also, this is an opportunity to check how good your services are. Often users won’t answer to feedback surveys, but they may provide some feedback on their product ratings. So, we can take the opportunity to find unsatisfied customers and their complaints. If we fix the problem, we have a good chance of winning back lost customers. In addition, when we look at past issues, we can predict the future. This is a good way to avoid losing customers. For example, let’s say you sell a software that you know is hard to set up. As soon as you sell it, offer assistance, to avoid customer frustration. The same goes for almost any product. Don’t assume your customer is going to read the entire instructions manual. Ad whenever possible, make things simple. Furthermore, once we look at inactive customers, we may look at patterns. So, if we know that once a customer hasn’t logged in for 30 days they’ll never log in again, let’s break this pattern. Let’s offer them reasons to log in. Or to interact. Maybe even to leave reviews. The best way to win back lost customers is not losing them in the first place. Things don’t always work out the way we expect. Sometimes despite our best efforts, customers may not feel favorable about our company. We may not handle all relationships as well as we should. And in these cases, a good customer win back strategy is our best starting point. Just discounts won’t do all the work, but they do help. Discounts, refunds, vouchers are always good to compensate the emotional loss. But they should be paired with good communication. And how do we start? This time we are looking at customers who haven’t repeated their purchase. If you are confident that the product itself isn’t the issue here, it’s a good idea to get in touch and offer them a discount. Think about it this way, if you were to advertise this product out there, you’d probably spend much more per sale, than what you’re “spending” on this discount. So now the next step is just importing these customers into MailChimp or a similar software. Send them a nice email with a good offer. But you may not know if your product is working as well as they should. In this case, you can offer them a discount in exchange for a survey. So all customers who complete a survey will get a coupon. This is a good way to track down your product issues, and also win back lost customers along the way. Today we looked into many ways to win back lost customers. We also discussed the importance of relationship marketing and how to implement it in your store. In addition, we went through many ways you can use Users Insights to identify lost customers. And in the end, we saw what we can do about them, and how to regain lost customers.